There are a gazillion books out there for someone to read. There are a lot of them that I like. There are some that I adore and then there are the precious few that I connect with on a whole other level. For me, there is just something extra special about a story that I can twist into fitting into my life, like its almost real. In recent weeks, I've had the pleasure of reading not one, but two books that did this. 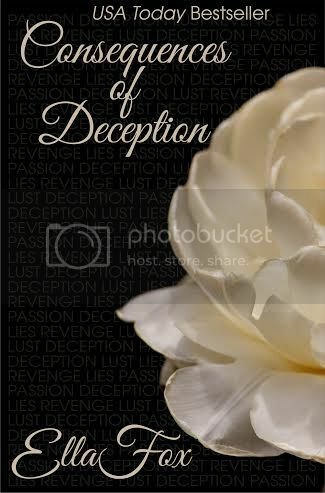 Consequences of Deception was one of them. It may sound strange, but I was immediately drawn in by one of the characters' names. Its a personal thing for me and made me feel special that a part of my life was in the story even though the author didn't do this for me specifically. I'm sure she had her own reasons for choosing that name that had nothing to do with me, but its nice to dream. This book is a little on the dark side and I can't fault it for that. I loved it. It was painful to read, though. I read this in one day, and I spent that entire day crying into my Kobo. My heart was breaking and mending and breaking and mending all day long. It was an endless cycle and I was so drained by the time I was finished it wasn't even funny. There's not a whole lot I can say without giving something away and I don't want to spoil this for anybody. I'm not sure why but this left me basically mush, I don't know if there is a real coherent thought rolling through my brain at the moment. I'm kind of just sitting here with my mouth hanging open in a daze. All I can say is that if a book can bring out that much emotion in me, its totally worth it. Absolutely, hands down!